And then I wonder, has God ever wanted to say the same thing to me? My Father has never failed to meet my needs, yet how often to I frantically cast about trying to provide for myself? Trying to build the perfect life. Trying to secure everyone’s happiness. Trying to ensure everyone’s safety. My Father has never failed me, so why this frantic struggle? Why not just sit back in the chair and wait for that smorgasbord of Cheerios to be presented, where I can munch to my heart’s content? I mean, think about it. Everything is God’s. EVERYTHING. Do you need something? Oh, he has one. He can move a complete stranger to give it to you! He is the God of the universe, what can he not provide for you? Sorry, fresh out of extra money for your heating bill in this universe… Right. He’s got it. 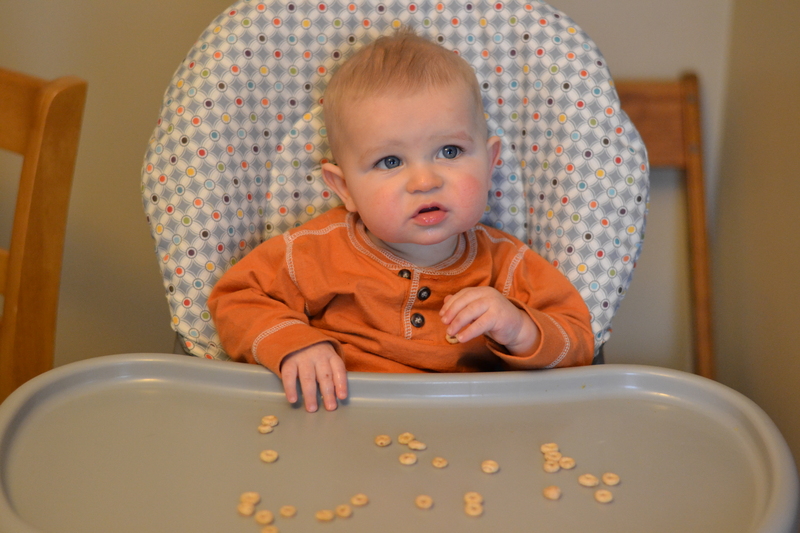 While I’m sure we are all hoping for more than plain Cheerios to fulfill our lives, I hope my point is clear. We don’t need to spend our days rushing about trying to make sure that everything is perfect and we have all that we need. We can trust our loving Father to provide. (Side note, this is not a license for laziness, though.) And even if the tray should happen to appear with something other than Cheerios on it, we can trust that our Father loves us enough to give us just what we need, just when we need it. 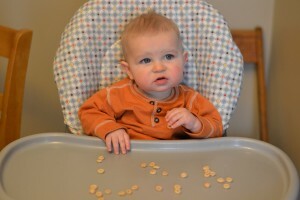 (I’m sure the first time Micah saw bright orange pieces of carrot on his tray instead of his beloved Cheerios, he was rather aghast. But he soon saw that I had provided him with yet another delicacy…) Trust that your Father knows what you need, and he will provide it at just the right time – not too soon, not too late – just the right time. Psalm 23:5 says “You prepare a table before me in the presence of my enemies. You anoint my head with oil; my cup overflows.” My cup OVERFLOWS. I love it. Matthew 6:26 says “Look at the birds of the air; they do not sow or reap or store away in barns, and yet your heavenly Father feeds them. Are you not much more valuable than they?” Aren’t you? So. Much. More. Valuable. Catherine, love the story and the lesson. And I can testify that provision can come. Like a laptop, for instance, right when someone needed on. Love love love!!! !This will touch so many in more ways than you know sweet friend.Thank you for this blessing today. Thank you Angel! I hope to be a blessing and encouragement! Once again well done! Love it!